This story provides an example of one of the hundreds of projects Mission Together is supporting around the world. 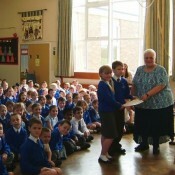 The assembly encourages prayer and fundraising as well as educating children about the world in which they live and enabling them to put their faith into action, to change the lives of children overseas and make the world a better place. On submitting the form, Mission Together will try to find a local speaker. The charity will be in touch with you directly.